I'm blogging all the way from Shetland today, thanks to the miracle of accommodation with free wifi. I'm on holiday here for two weeks, enjoying the remoteness, the wildlife and the history of this truly beautiful group of islands, which includes some of the remotest inhabited locations in Great Britain. Like a lot of people, I often aim for an easy read when I'm on holiday. I may not be one for lying on a beach - hence my choice of destination; so far temperatures have peaked at a balmy 13C - but a 'beach read' is still a pleasure now and again even if you're actually reading it in the cabin of an overnight ferry from Aberdeen to Lerwick. 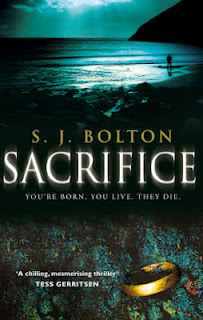 On this trip, I opted for Shetland-set thriller Sacrifice by SJ Bolton. I'd read another of her horror-tinged page-turners, Blood Harvest (also on holiday) and quite enjoyed it despite a few misgivings, so thought Sacrifice would be ideal to read in situ. Unfortunately, Sacrifice just failed to deliver much of what I was hoping for. The opening is pretty promising on some levels: heroine Tora, attempting to bury her deceased horse on the land she and her husband have bought, finds the body of a woman preserved in the peat. It's atmospherically written and sets up an intriguing mystery. However, one thing immediately grated on me, which was the presence of a magpie waiting to steal the horse's eye. I realise I am being hyper-picky, and yes, I am a birdwatcher, and yes, probably it doesn't matter in the big scheme of things, but there are no magpies in Shetland. There are plenty of other sinister carrion eaters - hooded crows, ravens - but no magpies. A minor irritation, this, one that non-birdwatchers wouldn't notice and one that I could have ignored ... except that there are plenty of other noticeable anomalies elsewhere in the novel with regards to Shetland life, language and wildlife, and as such, I simply didn't feel that it captured the islands effectively. Admittedly, if I'd never been to Shetland, I probably wouldn't have noticed this, but in a novel where the setting is so integral to the essence of the novel, not to mention the plot, it's important to get things right. A sense of place and atmosphere are seriously lacking in Sacrifice, which is a great shame. According to the acknowledgements at the end of the book, SJ Bolton didn't visit Shetland until after she'd written the book, and I can't say this revelation surprised me. Sacrifice isn't a straightforward detective thriller, despite it opening with the discovery of a corpse. Instead, it's tinged with supernatural elements that edge it into borderline horror territory. It's a genre I tend to enjoy - Phil Rickman, for instance, is a favourite of mine, and indeed, Blood Harvest, another Bolton novel of this type, was also fun. But this time, the extra elements are so daft and so confused in execution that I just wanted to roll my eyes. I could happily accept the presence of a sinister cult with roots in Norse mythology, but the villains of this piece appear to be some of kind of cross between trolls and freemasons. Moreover, we're expected to believe that one character who has spent his entire life trying to escape from this horror would suddenly decide to return to Shetland for no clear reason. On the police procedural front, we're apparently meant to accept that within a couple of hours, a hospital pathologist would not only have detected something as tiny as strawberry seeds in the gut of a preserved corpse, but also have identified the variety of strawberry from which they came, and throughout the book convenient deus ex machina events are clumsily executed. Heightened reality is one thing, but the suspension of disbelief in Sacrifice for me was far, far from willing. Most of the characters just didn't work for me either. Consultant obstetrician Tora is reasonably likeable until it transpires that she doesn't really understand how her husband bought their house, muttering something about a 'trust fund', and that she drools and simpers idiotically over not only her husband but also her boss, both of whom are set up as being desperately attractive and charismatic and yet are both dull as ditchwater. The only character I really liked, and who is by far the most three-dimensional, is DS Dana Tulloch, a police officer who enlists Tora's help in getting to the bottom of the mystery, but she's absent from large portions of the novel. 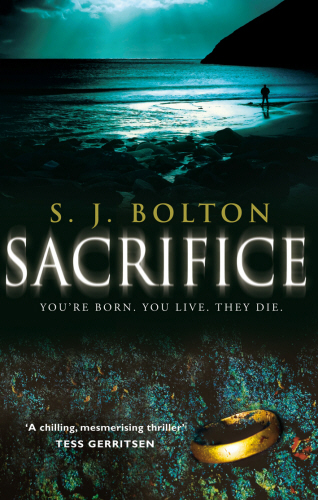 I wasn't expecting this to be a gritty, realistic thriller, but after enjoying Blood Harvest, and being aware that SJ Bolton's books have been nominated for various crime-writing awards, I did want it to feel cohesive, atmospheric and chilling. I didn't feel Sacrifice was any of those things, and as such, it was a disappointment. While I've been in Shetland, the bookshop in Lerwick and in the local museum have drawn my attention to Ann Cleeves' Shetland Quartet, a series of crime novels also set on the islands (and in fact, there was a crew on the islands last week filming a TV adaptation of one of them). I've ordered the first one, Raven Black, in the hope that it grip me a little more than Sacrifice did and capture the unique spirit of Shetland.